PLAINSBORO, N.J. - Hidden in the woods two miles from Princeton University's main campus sits a drab white building easily mistakable for a warehouse. Inside is one of the Ivy League school's most expensive experiments: a 22-foot-tall metal spheroid surrounded by Crayola-colored magnets. About half a dozen blue beams ring the sphere horizontally, while another set, painted red, rise vertically from the floor to wrap the contraption, like fingers clutching a ball. "Fusion is an expensive science, because you're trying to build a sun in a bottle, " Williams said. This endeavor in the New Jersey woods, known as the National Spherical Torus Experiment, was created to study the physics of plasma, in the hopes that one day humans will be able to harness a new source of energy based on the reactions that power stars. The project has been shut down for two years to undergo an upgrade that will double its power. The improvement costs million, and is paid for - like the rest of the Princeton Plasma Physics Lab - by the U.S. Department of Energy. "I keep telling them to take that down, " he said. But ITER is sputtering with delayed construction and ballooning costs, and U.S. physicists are increasingly worried that their work at home, such as the National Spherical Torus Experiment, will be sidelined to fund the international project. 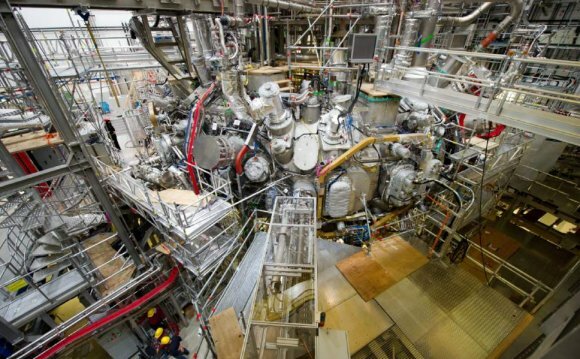 They see the domestic research as crucial to understanding the nature of the plasma used in certain fusion reactions - crucial, even, to getting facilities like ITER built in the first place. Meanwhile, critics view magnetic fusion research as a money-wasting boondoggle that will never be able to produce energy as cheaply as methods like solar and wind power. After the visit to the facility, Williams returned to his office and I met with his boss, Stewart Prager, the head of the Princeton lab. Sitting in a tidy glass-paneled office overlooking the woods, he recalled an old joke about fusion - it was "30 years away 30 years ago, and it's 30 years away now" - and explained why the quip has taken hold. "The true pioneers in the field didn't fully appreciate how hard a scientific problem it would be, " he said. Fusion scientists make an incredible proposition: We can power our cities, they say, with miniature, vacuum-sealed stars. According to those who study it, the benefits of fusion power, if it ever came to fruition, would be enormous. It requires no carbon drawn from the ground. Its fuel - hydrogen harvested from seawater - is inexhaustible. It emits no gases that warm the planet. And unlike its cousin fission, which is currently used in nuclear power plants, fusion produces little radioactive waste, and what it does produce can be recycled by the reactor.